WINE SLUSH FROSTED BLIZZARD DRINK MIX. 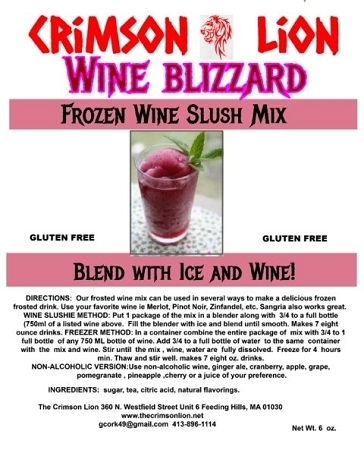 The original Frosted Blizzard wine mix can be used in several ways to make a delicious frozen frosted drink. Use your favorite wine ie Merlot, Pinot Noir, Zinfandel, etc. Sangria also works great. fully dissolved. Freeze for 4 hours minimum. Thaw out and stir well. Makes up to 8 four oz. drinks. 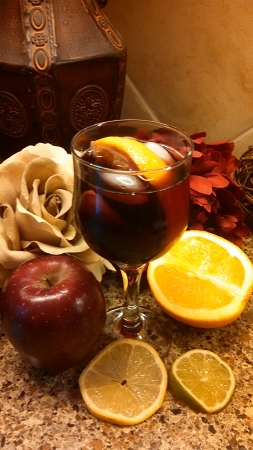 Put 1 package of the mix in a blender along with 3/4 bottle (2/14 cups) of Merlot or any red wine. Use white wine if a preference. Add remainder ice and blend until slushie. Makes up to 8 four ounce drinks.